The economy has affected the whole country, and Indiana is no exception. Indiana’s unemployment rate rose last month, which means that more Indiana residents are out of work—and even more are concerned about job stability. The job market has responded by becoming more competitive. With lay-offs and hiring freezes becoming more common, smart employees are honing their skills in an attempt to keep a competitive edge. One of the skills most valued in the workplace is the ability to make effective presentations. Unfortunately, though, a lot of people develop an extreme case of nerves when asked to speak to an audience. 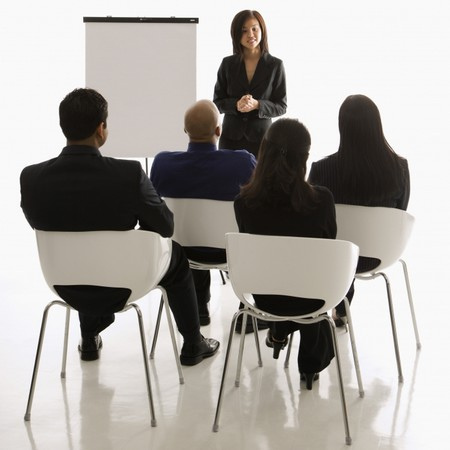 Fortunately, Dale Carnegie Training offers a few simple ideas that will help you make effective and informative presentations that gain the notice of your employers. It’s not just for Boy Scouts anymore. KNOW your material inside and out. Don’t worry about memorizing statistics and figures; but you should have a thorough understanding of your topic. First impressions are important, and the way you open will set the tone for the entire presentation. A strong start gives your audience confidence that you know what you’re talking about—and it will give you confidence as you continue the presentation, too. Know the main points that you want your audience to understand. If you need help remembering them, use visuals that will guide you from one point to the next. Provide verifiable facts and evidence that support your main points. Evidence backs up your statement and allows your audience to ask meaningful questions that lead to deeper understanding. You started strong; now you should finish the same way. Summarize the content of your presentation, have an action plan, and motivate your audience to utilize your plan. You’ve finished your presentation—and you did well! But now the questions begin. Even people who can make a polished presentation choke up just thinking about fielding unexpected questions. Instead of fearing that your audience will trip you up, though, see questions as another chance to make your case. Again, a thorough knowledge of your subject will help. Use examples as you answer each question; this will engage the audience and allow you to talk freely as you recount real-life situations. Remember: Prepare, practice a strong opening, make your points, present evidence, and end with a challenge to action—and you’ll make a great impression.